It's not a secret that the art of love and seduction has always attracted people's attention. Ancient Greek, Indian and Chinese treatises prove this fact. According to Greek mythology, the goddess Aphrodite gave mortals love and passion, so it is not surprising that the substances responsible for attraction and pleasure were called aphrodisiacs. In ancient times aphrodisiacs were very popular, they were brought as gifts to the kings. To enhance their attractiveness and desire, people used not only perfume with the addition of pheromones, but also brought gifts in the form of products - aphrodisiacs. Many people and cultures have their secrets of seduction, they depend on the place of residence, traditions and temperament. Today the borders are practically erased, and people have gotten the opportunity to add to their diet any product, even the most exotic ones. So what should we include in the menu to prolong youth and to ignite passion? 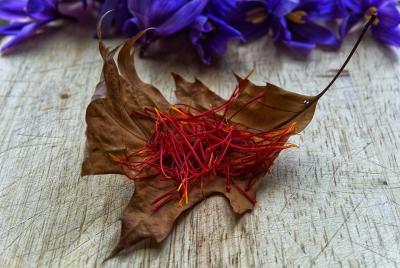 According to a report published by the scientists from the Queen's University, saffron and ginseng will help to strengthen the sexual desire. These spices showed the best results, despite the fact that the list of products was quite long. The scientists did not ignore chocolate and alcohol as well. However, it was noted that chocolate has more psychological than physical impact. As for the alcohol, it has either a short-term effect, or acts directly opposite. Cocoa is another aphrodisiac that was used by Maya and Aztecs to maintain male power. In order to achieve the best results, chili and spices were added to a hot drink. Today, cocoa is considered to be a drink for the creation of appropriate mood rather than an exciting one. The list of aphrodisiacs includes the Peruvian poppy - a vegetable that looks like a turnip. It will help you to strengthen libido and to increase stamina and fertility. The substances contained in the poppy will help to cope with stress, to improve metabolic processes in the body and to regulate the hormonal balance. Seafood is also a well-known aphrodisiac. Seafood contains a sufficient amount of iodine necessary for the proper functioning of the thyroid gland and the proper production of hormones. Oysters are very rich in vitamins E, A and zinc, they are involved in the production of testosterone and are the most famous and popular among the shellfish. A couple of fresh oysters with lemon juice will help you to strengthen the attraction. But the Japanese believe that mussels more than other seafood can enhance the male potency. For this purpose, Koreans prefer to eat snake meat, and the Egyptians use garlic. In the East, Tahini paste, made from sesame seeds, is used to provoke passion. It is believed that tahini will be much more effective in combination with honey. By the way, natural honey is also considered to be the elixir of life and youth. It has got not only anti-inflammatory and antibacterial properties, but it is also a part of different stimulating mixtures, the most popular of which is a mixture of honey and walnuts. Have you ever wondered why confectioners produce more candies from marzipan on Valentine’s Day? The answer is simple enough. This sweet almond paste has an exciting effect and is a favorite treat for all lovers. In fact, the list of "passionate" products is not limited to those that have already been mentioned. Avocados, pomegranates, eggplants, bananas, coconuts, olives, tomatoes, chestnuts and celery can also be added to this list. Among the spices, in addition to saffron and ginseng, there are ginger, horseradish, cinnamon, pepper, mustard seeds, tarragon, marjoram, cumin, wormwood, cloves and oregano. Add these foods to your daily diet and let the fire of your passion never go out!